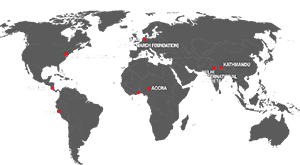 “Oversight of Public and Private Initiatives to Eliminate the Worst Forms of Child Labour in the Cocoa Sector in Côte d’Ivoire and Ghana” is a four and a half year project spearheaded by the Payson Center for International Development at Tulane University, USA, and financed by the U.S. Department of Labour. As part of the project, Tulane studies progress made towards the elimination of the worst forms of child labour and forced labour in the cocoa sector of these neighbouring African countries and towards meeting obligations under the Harkin-Engel Protocol, a voluntary agreement signed in September 2001 by the Chocolate Manufacturers Association (CMA) and the World Cocoa Foundation (WCF) and witnessed by the congressional offices of US Senator Tom Harkin and US Representative Eliot Engel. training of government officials in the two countries to remediate worst forms of child labour and monitor the number of children working in this sector. Tulane’s final report on “The Status of Public and Private Efforts to Eliminate the Worst Forms of Child Labour in the Cocoa Sectors of Côte d’Ivoire and Ghana” was published on 31st March 2011. The report refers positively to the manner in which the Harkin-Engel Protocol has been a catalyst for action over the last decade and has had significant impact on the incidence of child and forced labour in the cocoa sectors of the two countries. It also highlights the key role of the International Cocoa Initiative (ICI) whose remediation activities have reached nearly 300 communities across Ghana and Côte d’Ivoire. Tulane calls on the industry to scale up its consumption of product certified cocoa, specifically in the US market, as a means of assuring consumers that cocoa is being produced in line with the ILO’s Convention No. 182 on the Worst Forms of Child Labour. This recommendation calls on industry to increase support for laudable product certification efforts as its 4th-party farm audits provide location-specific, independent verification of the absence of the worst forms of child labour in the certified cocoa farms and plantations of Côte d’Ivoire and Ghana. This urges building on the current relationship with the ILO on the development of a child labour monitoring model. This recommendation calls for scaled-up support for the ICI and country-level child labour units enabling fulfilment of commitments made in the first and second extensions of the Protocol in order to reach the entire cocoa sector with sensitisation and remediation activities in both countries.